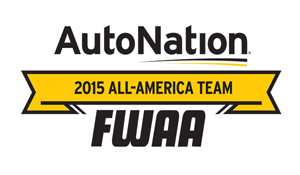 DALLAS (FWAA) – The 2015 AutoNation FWAA All-America Team was announced on Monday by the Football Writers Association of America. The 26-man first team is led by the Southeastern Conference with seven selections. Alabama running back Derrick Henry, the Heisman Trophy, Maxwell Award, Walter Camp Award and Doak Walker Award winner, is one of four players from the second-ranked Crimson Tide on the first team and leads a parade of 24 players from the Power Five conferences. This season, AutoNation is the title sponsor of the FWAA team, in conjunction with its season-long presentation of weekly FWAA national players and teams of the week, for which it made donations to the Breast Cancer Research Foundation in each recipient's name. For the fourth straight season, the announcement of the team, the second-longest continuously-published team in major college football, will be featured on SiriusXM Radio's “College Football Nation.” A two-hour special hosted by Mark Packer and Matt Leinart airs today at 5 p.m. ET. Since 1945, the FWAA All-America Team has been among the five teams used to formulate the NCAA's annual consensus All-America team, which will be announced Thursday. Since the 2002 season, the American Football Coaches Association (AFCA), The Associated Press, The Sporting News and the Walter Camp Football Foundation have joined the FWAA as the five designated selectors by the NCAA. Also representing the 2015 AutoNation FWAA All-America Team from Alabama, which is in the College Football Playoff at the Goodyear Cotton Bowl Classic, are defensive lineman and Outland Trophy finalist A'Shawn Robinson, linebacker Reggie Ragland and center Ryan Kelly, the Rimington Trophy winner. Tide defensive back Eddie Jackson was selected to the second team. There are two repeat first-team selections from the 2014 FWAA team: Baylor offensive tackle Spencer Drango, an Outland Trophy finalist, and Utah punter Tom Hackett, the Ray Guy Award winner for a second straight season. Three other teams – top-ranked Clemson, Baylor and Rose Bowl-bound Stanford – had two players each on the first team. Stanford's twosome on the first team are Outland-winning guard Joshua Garnett and sophomore kick returner Christian McCaffrey, a Heisman finalist. Baylor's other first-team pick was wide receiver Corey Coleman, the Biletnikoff Award winner. Clemson's teammates include defensive end Shaq Lawson and quarterback Deshaun Watson, the Davey O'Brien Award winner and a Heisman finalist who will lead the No. 1 Tigers against No. 4 Oklahoma in the Capital One Orange Bowl. Temple linebacker Tyler Matakevich, the Bronko Nagurski Trophy winner as the FWAA's national defensive player of the year, is the Owls' first, first-team defensive All-American and was one of two players on the first team from a Group of Five league, the American Athletic Conference. The other selection is from the Mid-American Conference, Northern Illinois defensive back Shawun Lurry. This is just the third season in the modern era (post-1950) that the FWAA has named a second team. Notre Dame had four players on the two teams (three on the second team). Michigan State and Oregon also each had three second-team selections. Michigan State defensive end Shilique Calhoun and Florida State defensive back Jalen Ramsey were selected to the second team for a second straight season. Duke defensive back Jeremy Cash, who was a second-team selection in 2014, made the first team this season. There were 13 seniors, seven juniors and six sophomores selected to the first team. The conference breakdown for those players is as follows: SEC (7), Big Ten (5), ACC (4), Pac-12 (4), Big 12 (3), American Athletic (1), Mid-American (1) and Independents (1). QB Deshaun Watson, Clemson 6-2 207 So. Gainesville, Ga.
RB Leonard Fournette, LSU 6-1 230 So. New Orleans, La. RB Derrick Henry, Alabama 6-3 242 Jr. Yulee, Fla.
OL Joshua Garnett, Stanford 6-5 321 Sr. Puyallup, Wash.
OL Jason Spriggs, Indiana 6-7 305 Sr. Elkhart, Ind. OL Ronnie Stanley, Notre Dame 6-6 315 Sr. Las Vegas, Nev.
DL Shaq Lawson, Clemson 6-3 270 Jr. Central, S.C.
LB Tyler Matakevich, Temple 6-1 232 Sr. Stratford, Conn.
LB Reggie Ragland, Alabama 6-2 252 Sr. Madison, Ala.
LB Joe Schobert, Wisconsin 6-2 236 Sr. Waukesha, Wis.
DB Jeremy Cash, Duke 6-2 210 Sr. Miami, Fla.
DB Vernon Hargreaves III, Florida 5-11 199 Jr. Tampa, Fla.
DB Desmond King, Iowa 5-11 200 Jr. Detroit, Mich.
DB Shawun Lurry, Northern Illinois 5-8 178 So. West Palm Beach, Fla.
KR Christian McCaffrey, Stanford 6-0 201 So. Castle Rock, Colo.
PR William Likely, Maryland 5-7 175 Jr. Belle Glade, Fla.
Over the years, the FWAA team has highlighted all the game's great players in several media forums. From 1946-70, LOOK magazine published the FWAA team and brought players and selected writers to New York City for a celebration. During that 25-year period, the FWAA team was introduced on national television shows by such noted hosts as Bob Hope, Steve Allen and Perry Como. After LOOK folded, the FWAA started a long association with NCAA Films (later known as NCAA Productions), which produced a 30-minute television program. The team was part of ABC-TV's 1981 College Football Series. From 1983-90, the team was introduced on either ABC or ESPN. In 2002 and ‘03, the All-America team was honored with a banquet at the Citrus Bowl. AutoNation is transforming the automotive retail industry through bold leadership. We deliver a peerless automotive retail experience through our customer-focused sales and service processes. Owning and operating 293 new vehicle franchises, which sell 35 new vehicle brands across 15 states, AutoNation is America's largest automotive retailer, with state-of-the-art operations and the ability to leverage economies of scale that benefit the customer. As an indication of our leadership position in our industry, AutoNation is a component of the S&P 500 Index. A new post-season NCAA football game whose net proceeds benefit the Breast Cancer Research Foundation, the AutoNation Cure Bowl takes place Sat., Dec. 19 at 7 p.m. ET at the Citrus Bowl in Orlando, and will be broadcast by CBS Sports Network. Georgia State, making the program's first bowl appearance, takes on San José State.